me he ido y he vuelto. de Venezuela, de Caracas, de mi. de la venezolanidad no se escapa uno. ni se esconde detrás de los slangs venezolanos de moda. es difícil describirnos sin contradecirnos. es casi imposible “leernos” si no nos has saboreado por un largo tiempo. y aún así tendrían que seguir probándonos para entender cómo vamos cambiando. no somos lo que parecemos, aunque a veces somos más que predecibles. somos tan buenos como malos. mejores. peores. tan echados pa´lante como conformistas. si fuéramos un producto sería imposible colocar todos nuestros ingredientes en la etiqueta. y siempre uso la misma metáfora. y también aquella por lo que siempre queremos volver. Simonovis has spent the last ten years in prison for unconfirmed crimes. For nine of those years he was kept in a 2m x 2m basement. He has become the most emblematic Venezuelan prisoner in current political times and he has just finished writing his dramatic autobiography El prisionero rojo (The red prisoner) on paper napkins. On March 4 this year, Ivan Simonovis, a former deputy head of the Venezuelan police force turned 54 years old, although the harsh treatment he has received in prison over the last 10 years has left him looking more like an 80-year-old man. He is expected to serve a 30-year sentence in prison. He has been doing time for crimes which according to him, his lawyers, the press, and diverse human rights organizations have yet to be proven against him. The reason they have not been proven is simply because he did not commit them. His Via Crucis began in 2002; until then he had been one of the most reputable police deputies working for the Venezuelan Scientific Bureau of Penal and Crime Investigation. After 23 years of continuous service he was promoted to Secretary of Civil Security for the city of Caracas working under Major Alfredo Peña (back then a Chávez supporter, later becoming a political dissident and finally exiled for political reasons). On April 11, 2002 the opposition held rallies in Caracas that were even larger than the ones we have seen in recent weeks against President Nicolás Maduro. That day protesters marched to the presidential palace to demand President Chávez’s resignation. That massive protest took place in the midst of a national strike and resulted in the death of 19 protesters and a short-lived coup d’état that removed President Chávez from power for a total of 47 hours. A court found Simonovis guilty of complicity in two of those deaths; even though his lawyers, including his own wife María del Pilar Pertiñez (Bony), presented evidence to the prosecution proving his non-involvement in the uprising against Hugo Chávez that day. He was subsequently sentenced to the maximum sentence under Venezuelan law: 30 years in prison for crimes against humanity. Simonovis defence team has spent years battling a highly corrupt judicial system. In 2012 the former pro-Chávez magistrate Eladio Aponte denied former President Chávez’s insistence that in Venezuela there were no political prisoners. Aponte accused the Venezuelan government of political persecution against himself and ended up having to ask for political asylum in the US. He later confessed that Ivan Simonovis, his colleagues Henry Vivas, Lázaro Forero and eight other members of the police force also arrested at the time were convicted from a direct order by then president Hugo Chávez. Aponte admitted in a written confession that he was forced to draw up a verdict against Simonovis without even looking at his records and to ignore the annulment option submitted by Simonovis’s defence team because Chávez had said he wanted to have it all done and dusted as soon as possible. Henry Vivas and Lázaro Forero have both been diagnosed with cancer and have now been freed but in Simonovis’s case the Venezuelan judicial system continues to turn a blind eye. Last December a small ray of hope shone on Simonovis’s case. The former vice-president to Chávez, José Vicente Rangel, petitioned for a reassessment of the court case. “Nicolás Maduro, successor to our commander (Chávez), does not lead a repressive regime. He has a profound sense of human empathy and for that reason he must pardon Simonovis. Very few people remain in prison for such a long time especially when they are in such poor health. What is preventing the current government from providing a measure of grace? I do not understand what is going on.” Rangel made these declarations after learning that Simonovis is now suffering from 19 different diseases. It is believed that at any moment Simonovis’sspinal cord could collapse due to its fragile state. Even though his health condition has been certified by a military medical board at the request of a judge, his appeal for early release on humanitarian grounds is still pending. Simonovis has found solace in his writing. In December 2013 he published his autobiography titled El prisionero rojo (The red prisoner). It has resulted in a 438-page book describing his experience, which was initially written on paper napkins and later transcribed by his wife, and a few other friends. Many say that the Simonovis case exposes the cruelty, abuse of power and the judicial system’s manipulative tactics, a legacy like no other of Chávez’s regime in Venezuela. Bony, his wife was 39 years old when her husband was convicted. María del Pilar Simonovis (Bony)avoids holding false expectations about her husband returning home any time soon. “I do not want to suffer again and again” was her response when asked if she thought the father of her children would ever return home. “Ivan junior was 12 years old and Ivana was 7 when their father was imprisoned” said Bony with tear-filled eyes after confessing how many times she had already imagined the reception she would give her husband on his return home. Very often she had thought she would take him to see her mother Luise, but sadly she passed away in 2013 not having been able to realise her wish to see her son-in-law freed from prison. Even Pope Francis has interceded in Simonovis’s name but many fear that former President Chávez’s unpredictability is now compounded by apathy from incumbent President Maduro. Ivana Simonovis’s cry for pity in the name of her father has moved thousands of people, but not Nicolás Maduro. 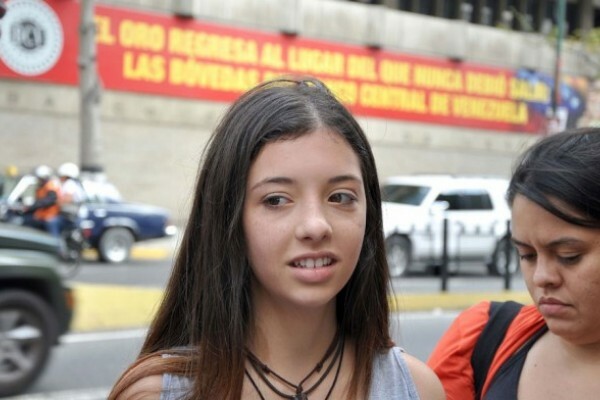 Ivan Simonovis’s daughter has sent several letters to the Venezuelan government. In her last letter she pleaded for her father’s freedom on account of his deteriorating health. Thousands of people cried and showed their support for Ivana when the letter was published last year, but Maduro didn’t even flinch. According to opposition leader Delcy Solorzano, the Chávez regime has left a legacy of 3,000 political prisoners over a period of 14 years from 1999 to 2013. She believes the current situation under Maduro is much worse. Source: hoy.com.ec “El caso Simonovis desnuda la crueldad del chavismo”. hoy.com.ec. 4 de Marzo 2014. “Ultimas Noticias”. Enero, 30 del 2013. Esta es la segunda vez que les escribo. No me da pena insistirles. El dolor puede más que la pena. Les juro que ya no puedo más. Ya me cansé de llorar. Estoy agotada. Quiero pedirles de nuevo un poco de clemencia. Ya mi papá, Iván Simonovis, y todos nosotros, su familia, hemos sufrido demasiado. Sufrir cansa. Llorar cansa. Extrañar al padre de uno cansa. Siento que soy demasiado joven para estar tan cansada. Me parece injusto que la política me arruine la vida. Todos los días me asomo con susto en el espejo, porque siento que tengo canas en mi cabello. No las veo, pero las siento. Y tengo 15 años. Es muy rara esta sensación. Ya mi sonrisa no es la que sale en las fotos de los álbumes de la familia. Mi sonrisa se quiebra a cada rato, como una galleta. Porque así están los huesos de mi papá. Se han vuelto una galleta por tanto encierro, por tanto no moverse, por tanta sombra. Por favor, les pido, devuélvanle el sol. Devuélvanle un poquito de vida. Ya bastante ha pagado lo que Uds. consideraron que debía pagar. Su salud esta tan deteriorada que tengo miedo -mucho miedo- de que mi papá termine paralítico, en una silla de ruedas. Y más así. Solo. Sin su gente, sin los únicos brazos que lo pueden abrazar. Mi papá no está nada bien. Su columna está demasiado frágil. Se puede romper sola, sin que nadie la toque. Sus huesos, dice el médico, tienen la edad de un anciano. Sus huesos ya pagaron el doble del tiempo de su condena. Su ánimo también. Y su familia. Sea justa o no su prisión, creo que ya todo es demasiado. Ya todo se ha vuelto inhumano, cruel, excesivo. Señores del Estado Venezolano, una medida humanitaria como la que les pido sería un gesto noble, necesario, hermoso. Un gesto importante en estos tiempos tan duros. Estoy tan agotada del odio de parte y parte. Creo que muchos estamos así. Un gesto de nobleza no les va a hacer perder nada de lo que tienen y, en cambio, los hará más humanos. Quiero volver a tener 15 años y un padre a quién abrazar. No tengo más argumentos. Solo un exceso de dolor. Fuente: Simonovis, Ivana. “Lea: La carta de Ivana Simonovis al Estado venezolano ” Ultimas Noticias . Enero, 30 del 2013. This is the second time I write to you. I am not ashamed of my insistence to you. The pain that I feel is greater than my shame. I swear I cannot go on any more like this. I am tired of crying. I am exhausted. I am once again pleading clemency for my father. My dad, Ivan Simonovis, as well as all of us members of his family have already suffered enough. This amount of suffering is exhausting. To cry like this is exhausting. To miss one’s father is exhausting. I feel I am too young to be this exhausted. I think is rather unjust for politics to ruin my life in this way. Every day when I wake and I look in the mirror I am afraid of what I am going to see because I feel I have grey hairs in my head. I cannot see them but I can feel them. I am only 15 years old. This is in fact a very rare feeling. My smile is no longer the one that appears in the family photo albums, my smile often crumbles like a cracker, because that is how my father’s bones are now. His bones have become like fragile crackers due to the long confinement, the lack of movement and the lack of light. Please, I beg you give back the sunshine to my father. My smile is no longer the one that appears in the family photo albums, my smile often crumbles like a cracker, because that is how my father’s bones are now. His bones have become like fragile crackers due to the long confinement, the lack of movement and the lack of light. Please, I beg you give back the sunshine to my father. His health has deteriorated so much that I fear my father will end up paralyzed, in a wheelchair. Alone, without his people, without those who can offer him a hug. My father is not well at all. His vertebral column is so fragile it could spontaneously crumble at any moment. His bones, according to his doctor, resemble those of an elderly man. His bones as well as his soul and his family have now served double the sentence he was condemned to. Whether he was justly imprisoned or not I believe his plight has gone to far. Everything has become inhuman, cruel and excessive. Members of the Venezuelan State, I plead to you on humanitarian grounds. It would be a much needed, noble, beautiful gesture towards my father, an important gesture to us Venezuelans living though such hard times. I am exhausted from the hatred seen towards each other on both sides of this struggle. I believe many of us think the same. Such a gesture will not make you seem weak on the contrary you will show the world a more humanitarian side of yourselves. I want to be 15 years old again and to feel my father’s hugs again. I do not have any more to say, just an excess of pain. Source: Simonovis, Ivana. “ Lea la carta de Ivana Simonovis al Estado venezolano”. Últimas Noticias. 30 Enero 2013. Main photograph: Taken from the original source “Últimas Noticias. Lea: La carta de Ivana Simonovis al Estado venezolano”.